If you love cars as a whole, this is something that you'll love. The 6th Philippine International Motor Show(PIMS 2016) is all set to give the latest in motoring industry as they showcase what's new in automotive technologies and vehicle models. 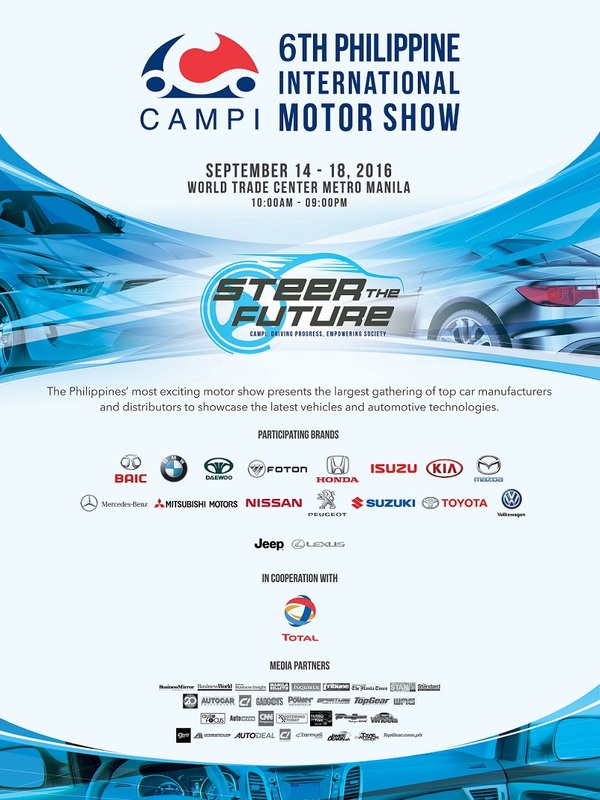 The Chamber of Automotive Manufacturers of the Philippines, Inc. (CAMPI) brings back the much-awaited Philippine International Motor Show (PIMS) from September 14-18, 2016, at the World Trade Center Metro Manila, Pasay City. To give you some stats, in 2015, the automotive industry surpassed its sales target of 272,000 vehicles when CAMPI members sold a total of 288,609 units. This year, CAMPI is confident of achieving its initial target on the back of continued supply of vehicles, attractive promos, and affordable financing schemes, among other economic indicators. The 6th PIMS is co-presented by Total Philippines Corporation. Tickets to the showcase are available at SM Tickets for only Php100. For more information, visit smtickets.com or dial 470-22-22.